If your studio's musical output is largely synthetic in nature and you are considering an increase in tracks, then Steinberg Research's Pro-24 recording software for the Atari 520ST micro could prove a better option than a conventional tape recorder. Tony Hastings tells why. When Atari unveiled their 16-bit 'home' micro last year, the world was introduced to the first computer with a built-in MIDI interface. "Fantastic" we all said, "but where's the software?" After all, a computer is just a pile of electronic rubbish without the right instructions to tell it what to do. Perhaps it was the old story of 'get it out fast to zap the competition' ie. the Commodore Amiga. Or maybe there was nobody around with sufficient working knowledge of how to write on it. But the fact remains that there hasn't been a good piece of music software written for it yet. But true to form, Germany's Steinberg Research have just launched a 24-track Sequencer program for the Atari that blows away just about anything else on the market (meaning other sequencers and computers). I have a feeling that this is just the tip of the iceberg and that in a few months' time we'll be deluged with Atari software from all over the world, but in the meantime Steinberg are just about the first to release something and they would appear to have an eager market standing by whose appetite has already been whetted by the facilities on their Pro-16 Sequencer for the Commodore 64/128 (reviewed April 86 issue). For those of you who don't know about the Atari (where have you been? ), it's a 16-bit micro with one megabyte of onboard memory and a screen display that utilises a system called GEM (graphic environment manager), which is very similar to the Apple Macintosh's display. It uses windows, boxes, pull-down menus etc - and, of course, the famous 'mouse'. The Pro-24 uses all of these graphic facilities to their maximum which are stored in about 190K of memory space - that's around three Commodore 64's worth of memory just to tell it what to do! So you can understand why software has been a little while in arriving. If you've never worked with the Atari before, you'll be pleasantly surprised, as I was, at how 'user-friendly' everything is - no need for techno-fear here. Nearly every command is input from the mouse instead of typing it, and everything is explained clearly to you on the screen. Before you can load the Pro-24, you must first insert a supplied 'key' into the cartridge port of the computer. This stops other people (theoretically) from pirating the software, but allows you to make back-up copies of the master disk to protect the program. On loading the program, you are presented with a screen that is laid out like a typical tape recorder (Figure 1). The bottom corner has all the sort of controls you'd expect to see - Play, Record, Rewind etc. Along the top are the 24 'track boxes' where you choose which tracks to record, monitor and so on. The bottom band contains all of the track velocities displayed, in true Steinberg style, like LED ladders on a mixing desk. The remainder of the screen is occupied by various 'buttons' that can all be 'pressed' via the mouse and cursor. The screen display graphics are very clear and, with just a hint of grey shading, do give you the impression that there really are buttons and switches on-screen. The accompanying manual for the Pro-24 is over 70-pages long, which should tell you a little about how involved this program is. I'm therefore not going to delve into the fine details now because there truly isn't room, so what I'll do is run through the general aspects of its operating system to demonstrate how easy it is to use. The design philosophy behind this program was to make it like the ultimate solid state tape recorder. No more sequences to chain together, no more song steps; what you've got is 24 tracks of 'electronic tape', if you like, that are virtually endless. To record a piece of music, you have to set the length of it (by counting the proposed number of bars) into two special screen boxes referred to as the Left and Right Locators. For example, say you want to record eight bars of music starting at the beginning of the 'tape', you would set the Left Locator box to 1/1/0 (because you want to start on the first beat of the first bar) and you'd set the Right Locator to 9/1/0 (because you want to stop at the end of bar eight ie. at the beginning of bar nine). This three number description specifies the Bar/Beat/Fine Count (the Pro-24 breaks down a musical bar into 384 Fine Count divisions) for very accurate time-keeping. The next stage is obviously to choose which track(s) you want to record on and this is done by moving the screen cursor to the relevant track box (1-24) and clicking the mouse button whilst pointing at the record status arrow. You can opt foran audible count-in (beep) if you want, then all you do is re-position the cursor over the displayed 'Record' button and click the mouse. After two bars of tempo, the Pro-24 will begin to record everything that you play on your connected MIDI keyboard. 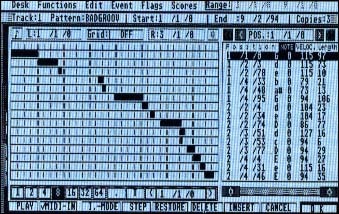 Unlike Steinberg's Pro-16 Sequencer (for the Commodore 64), none of what you input on the Pro-24 is quantised (auto-corrected to the nearest beat). This allows you instead to choose your own degree of quantisation at a later stage in the recording and to keep on altering it as much as you like without losing your original input timing - very useful for getting the correct 'feel' to the music. 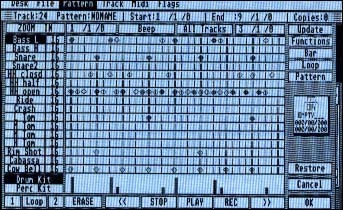 The Atari computer thinks of the different parts that you record as 'patterns', and as soon as you record a pattern it is given a number to identify where it occurs on the track. You are also able to give that pattern a name of your own eg. bass. After recording a track satisfactorily, you can move the cursor to another track box and select record once more. If this recording is to be an overdub, then you won't need to reset the Left and Right Locators because they stay the same until you change them, and for further convenience, selecting record mode always returns the 'tape' to the position indicated in the Left Locator box - instantly! Obviously the Pro-24 has all the music recording features you'd expect like tempo control, time signatures, soloing and muting of tracks, plus the extremely useful MIDI delay as pioneered on the Pro-16. One of the most required features of any sequencer is the ability to copy bits of music to other places within a song/track, and the Pro-24 is no exception. You have no less than five different ways to copy! This might sound like overkill, but Steinberg have thought of just about every different situation where copying can be made easier and quicker. There's Multi-Copy (Figure 2) for copying more than one pattern at a time, Track Copy, Pattern Copy, Pattern Repeat and Append. Append is a special function to allow you to join one pattern onto the end of another pattern by specifying their names. After you have recorded your music tracks, there are many features on the Pro-24 that allow you to change it in specialised ways including all MIDI settings The most exciting being a system of step-time editing called 'Grid Manipulation'. Basically, you are presented with a grid that is always two bars long (from left to right) which initially displays the first two bars of your sequence (see Figure 3). The grid is divided vertically with eight thick lines to indicate the quarter-beat and horizontally with sixteen fine lines. You are able to set the definition of the grid at the top of the screen and the smallest musical division it will display is a 16th-note triplet. That means each of the thick vertical beat markers is separated by five fine lines. The idea is to enable you to see exactly where the notes that you have played are in relation to the whole beats. Because the Pro-24 employs realtime note input with no quantise (what you play is what you hear), many of your notes may fall 'in-between' beats, and sound slightly out of time. But using the cursor and mouse control, you can move the notes about after playing until they are in the right place. The notes are displayed from left to right running diagonally down the screen (Figure 3). So the first note of the sequence would be in the top left-hand corner and the last note (if you played all the way through two bars) would appear in the bottom right-hand corner. Chords are shown as stacked because they obviously start at the same point. The reason for this layout is to enable all and any notes that you play to be displayed on a separate line. If you follow the note along to the far right of the screen, you'll see a display that tells you what the note is, how long you played it for, what position in the bar it is (to an accuracy of 1 in 384) and what velocity you used. The notes themselves are displayed as black blocks, each a different length depending on how long you played the note for. If you played the first note of the sequence and held it down for two bars, you'd end up with a thick black line right across the top of the screen. Again, using the cursor and the mouse, you can modify the length of any note later. In the display box to the right, you can change the velocity of the notes and perform all the other edits described by inputting numerical data rather than physically changing the note with the mouse and cursor. You can also input notes from a MIDI keyboard so you have a powerful step-time composition facility available as well as editing. As I stated at the beginning, this isn't a detailed review because there just isn't the space to describe everything (short of writing a series). But you can take my word for it, that the Pro-24 will do anything you'd expect and more. To coin a phrase, I was so impressed I nearly bought the company. The Pro-24 displays look classy and professional (due in great part to the Atari's wonderful graphics) and although it is a very extensive and involved program, it is by no means difficult to understand or operate. The Steinberg philosophy appears to be to allow you at least three or four ways to perform every function, thus making operation of the Pro-24 as simple and effective as possible. The software has been a long time coming but maybe we in Britain are only just ready for it, after all, how many people do you know who own an Atari 520 or 1040? So, to save musicians going into computer shops looking for an Atari, all UK music dealers who stock the Pro-24 package will also be supplied with Atari computers. A good move undoubtedly. The last time I reviewed a Steinberg product (the Pro-16) I gave it 10 out of 10, so where do you go from there? 20 out of 20? The only drawback is that I'm going to have to sell my Commodore and Pro-16 to buy one!